If you haven't heard, PetArmor™ is a new flea and tick medication that works like others on the market, but at a fraction of the cost. As a great dane owner, I'm no stranger to large pet bills...not to mention large food bills and large piles in my back yard, but I digress. The point is, who wouldn't love to save a buck or two when it comes to pet expenses? Yes, we love our four-legged furries as family, and they deserve the best care possible, but that doesn't mean it should cost an arm and a leg. 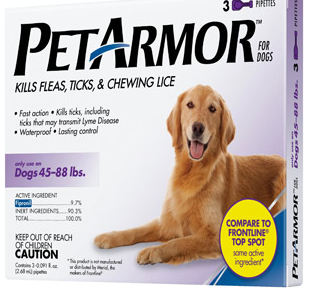 Now, thanks to PetArmor™, we can protect our pets from those pesky parasites and save a pretty penny too. You'll find it at Walmart for $25-$35 for a 3-month supply. So, what's the scoop on this new med and how does it compare to market leaders like Frontline? protection as Frontline. For years, Frontline was the only flea and tick medication of its kind on the market. Now PetArmor™ offers the same active ingredient (fipronil), in the same concentration as Frontline, so it's just as safe and effective against fleas and ticks. Fipronil is the number-one active ingredient recommended by veterinarians for flea and tick control. Also, PetArmor Plus contains S-methoprene, just like Frontline Plus, which prevents flea eggs from hatching and growing up, and then laying more eggs. PetArmor is a generic version of Frontline with the same active ingredient—fipronil. The fipronil patent (U.S. Patent # 5,232,940) has expired, clearing the way for generic products to be available. We've made it up to 50% less expensive* and available in stores where you shop, because we'd like to help more pets stay flea and tick free. PetArmor is all about providing greater access to affordable pet medications in support of better health for all pets. As an official flea and tick treatment of the ASPCA, PetArmor protection will be offered to dogs and cats in the ASPCA’s Adoption Center and clinic. Additionally, we are working with the ASPCA to launch the PetArmor Protection Pledge to create a community dedicated to better pet health. We encourage you to visit our Facebook page (www.facebook.com/PetArmor) to take the pledge. Each pledge taken triggers a $1 donation to the ASPCA, up to a maximum of $100,000, to help pets in need. We hope you’ll take the pledge and rally others to do the same." I have been using PetArmor on our dane, Bella for a month now and it seems to be working well. We live in the mosquito and tick-ridden south and spend a lot of time outdoors. Bella has not been bothered by bites and I have not seen a single flea or tick on her. (I know they're out there, we pulled a tick off of my daughter about a month ago!) Of course, you should always consult your vet before using any medication for your pet. Great news for my pet-loving readers, PetArmor is offering a sweet gift pack giveaway! Leave a comment on another post and let me know you did. Be sure to leave a comment for each entry and a valid email address. Open to U.S. only. Winner will be chosen by random integer selection. The winner will have 48 hours to claim the prize or a new winner will be chosen. Contest will close on June 30, 2011 at 12:00 AM EST. Good Luck!!! I love my Wyatt because no matter when you see him he has a smile,Yes he smiles, and a wiggy waggy of his tail for me! Although my pup gives me fits sometimes, he has quite the personality. I love it when he lays on his belly and arm-crawls across the floor - always makes me laugh! And, of course, unconditional love is the most amazing gift ever! Coleman's always excited to see me. Thanks for stopping by and following. I'm your newest follower. What I love about my pet is his sweet nature, his beauty, his intelligence, and his playfulness. I follow Pet Armor on Facebook as Sarah Bastin. I follow you on Facebook as Sarah Bastin. I follow you on Twitter as @sarebstare. My pets are hilarious to watch- just so funny sometimes! I love both of my dogs because they are my best friends, my jogging and hiking partners and are always excited to see me! They don't ever judge you or hold a grudge and they make me want to be the great person they THINK I am! They enrich my life every day and I am so grateful. They are both rescues and have taught me so much about compassion, love and devotion. They have taught me about responsibility for another living thing and have also allowed me to meet new people at the dog park or just when we're out! I also follow you on Facebook as Jessica Monnolly. Thank you! I love my dogs Milele and Kouga because they add so much love and joy to our lives. We're getting a new puppy in a couple of weeks (I've seen him on video) and what I love about him is how cute and smart he is! He's a miniature poodle. I like Pet Armor on Facebook with my username Mary Happymommy. I like Serendipity is Sweet on Facebook with my username Mary Happymommy. We love our dog because she is part of our family. Where we go, she goes. She loves everyone and every dog and they love her in exchange. She asks for nothing in return except our love. I love that my pets are so loving and loyal. They are funny and entertaining too. I Become a fan of PetArmor as Kelly Ann T.
I love that no matter how I am feeling my boy can make everything seem so much brighter! I love how happy petting my cat makes me feel after a long, stressful day! Serendipity is Sweet Facebook fan! I love his sweet nature! We love our two dogs, Misty and Cocoa! Both are sweet-tempered, lovable doggies who are great with the kids and who are always ready to guard the castle! So of course we want to keep them safe with flea and tick prevention. This new line of products sounds great! I love all by dogs because they are so cuddly! I love my bassett/beagle mutt mix because she is fun to take walks with. I love how my cat follows me around everywhere. She sleeps with me all night and comes to me when she can tell im in a bad mood. What I love most about my pets is their unconditional love and devotion towards me.